Coding for kids is cool with Raspberry Pi and this elementary guide. Even if your kids don′t have an ounce of computer geek in them, they can learn to code with Raspberry Pi and this wonderful book. 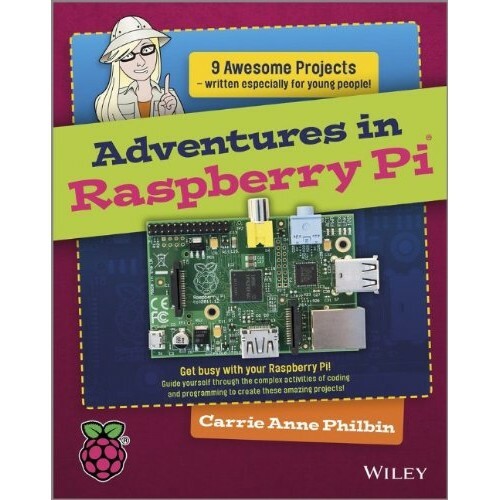 Written for 11– to 15–year–olds and assuming no prior computing knowledge, this book uses the wildly successful, low–cost, credit–card–sized Raspberry Pi computer to explain fundamental computing concepts. Young people will enjoy going through the book′s nine fun projects while they learn basic programming and system administration skills, starting with the very basics of how to plug in the board and turn it on. Each project includes a lively and informative video to reinforce the lessons. It′s perfect for young, eager self–learners—your kids can jump in, set up their Raspberry Pi, and go through the lessons on their own. The new Raspberry Pi 2 encompasses a significant performance increase over its single-core based pre.. The Raspberry Pi compute dev kit is designed for the benefit of embedded systems developers who wi.. The original Raspberry Pi Model B and its successors put a programmable computer within reach of eve..